Title [Coroner Traeger and other men investigating the Iroquois Theater fire, standing among the ruins of the interior of the theater] [graphic]. 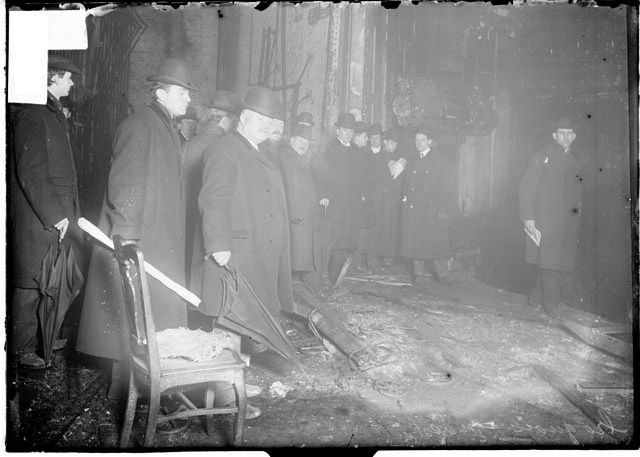 Collection summary View of Coroner Traeger and other men investigating the Iroquois Theater fire, standing among the ruins of the interior of the theater in Chicago, Illinois. Iroquois Theater (Chicago, Ill.) Fire, 1903. Geographic coverage Chicago (Ill.) 1900-1909.